They were closing the drugstore, and Alfred Higgins, who had just taken off his white jacket, was putting on his coat and getting ready to go home. "All the Years of Her Life"
Holding out her small, gloved hand in his palm, he patted it with his other hand, and they both laughed as though he had done something foolish but charming. The whole city was quieter now, the streets flowed away from them without direction, but there was always the hum underneath the silence like something restless and stirring and really touching them, as the soft, spring night air of the streets touched them, and at a store door he pulled her into the shadow and kissed her warmly, and when she didn't resist he kept on kissing her. Sitting alone at his table in the cool evening, his overcoat wrapped around him, and the black hat on, he did not look the same at all. It was the first time he had worn the hat in France. 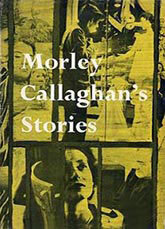 A funny thing happened when I read Morley Callaghan's Stories recently. It was at least my second reading for these stories, and I saw this time how very old-fashioned they were. But that's not what was strange. At the same time, I was reading a book of stories by Katherine Mansfield, written a decade or longer before most of Callaghan's. I was alternating, reading one of his, then one of hers. Mansfield is known for being one of the revolutionaries of twentieth-century storytelling, replacing the old rise-and-fall of linear narrative with many small, seemingly unconnected events that accumulate into an overall impression. Callaghan writes as though this revolution never took place, with intensely emotional, involved relations between characters coming to a sharp point. He has no problem with spelling out a character's feelings at any particular juncture, or even spelling out the moral of the tale. So old-fashioned. So out of touch with the modernist trend. But that's not the funny part either. The strange thing is that after I'd read a lot of both authors, it was Callaghan's stories that stayed in my mind. It was his directly related characters that I found myself thinking about. I have a feeling that—however much I or other moderns can deride his verging-on-corny style—some of his most affecting stories will stay with me a long time, whether I want them to or not. Actually there are two kinds of Callaghan stories. First, the short, moving stories that take place almost in real-time, usually involving poor folks involved in some moral dilemma. The woman wanting to buy a hat which will displease her husband because they can't afford it. The young man trying to avoid introducing his affluent girlfriend to his poor parents who had sacrificed to put him through school. The grocer watching a boy he suspects of planning to steal an apple. Two destitute people vying for a dollar dropped by a drunk. Simple possessions—a baseball cap, a kimono, a pair of shoes—are often central, representing the characters' hopes and disappointments. There is little irony in these stories, no sneering at the less admirable characters. The mundane titles could be taken for titles of Norman Rockwell paintings: "All the Years of Her Life", "A Cap for Steve", "The Shining Red Apple", "A Very Merry Christmas", "Very Special Shoes", "Two Fisherman", "The Two Brothers". The stories however are far from nostalgic or sentimental. My favourite, "Two Fishermen", for example, is about a small-town reporter who befriends the visiting hangman and then is caught in a local protest against the man's work. It goes on in this vein. Such overheated prose, in any era, should have been trimmed or replaced to help the reader learn all this about the characters without being told directly. The plot itself is not bad, concerning a man who comes to visit a boy who never learns the man is his father. When he eschews this overly descriptive approach though, such stories by Callaghan deliver raw sentiment effectively. He homes in on a turning point in someone's life, most commonly the moment when some—often a young person—is suddenly made aware of how the world really is. And he makes us see it too. That's the tenor of the majority of Callaghan's stories. The other kind of Callaghan story though is so different, it might have been written by another author. These are usually longer tales. Not at all intense. Uninvolved. As though he is dispassionately reporting the salient points of his characters' lives. In stories like "Last Spring They Came Over", "A Cocky Young Man", "Now That April's Here" and "A Girl with Ambition", he follows characters he doesn't seem to empathize with or depict from the inside. Which is odd as they are characters you would think Callaghan would know best—being, like him, journalists, authors or artists. Such reportage is more in line with the modernist attitude. But even here Callaghan displays scarcely an ironic note. He isn't trying to create an impression. He's just saying, "Here's an interesting person I once ran across. This is all I knew of him—what do you make of it?" These stories usually end without a crisis having been passed or a conclusion reached—the odd character just moves on and we lose touch. Much as happens in real life. And these stories also work. So Callaghan can write in this detached fashion when he wants to. But he is moved to write the other kind of story more. Many other stories I have written might have been included in this book, but these are the ones that touch times and moods and people I like to remember now. Looking back on them I can see that I have been concerned with the problems of many kinds of people but I have neglected those of the very, very rich. I have a story that begins, "Once upon a time there were two millionaires," but I haven't finished it yet. Now, because of his stories, we also have those times, moods and people to remember vicariously through his writing. As far as I know, he never did finish that story about millionaires. And I don't miss it.